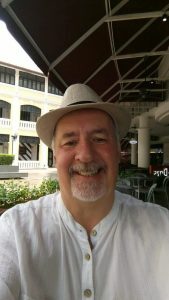 With over twenty years experience of traveling to East Africa and particularly to Tanzania, Mark has the expertise and knowledge to put together the Adventure of a Life Time. He named it A Swahili Sojourn. You are very welcome to discover this photographer’s dream destination, this nature lover’s paradise. Most characteristic for his Safaris is that he serves you the authentic Tanzania. He makes friends very easily and they have shown him special places. You are welcome sometimes at their homes for lunch, dinner, to enjoy their musical skills and more. Also you will find out Mark himself is a great storyteller. Will you allow Mark to show you his love for Tanzania and its people? Sojourn: A stay, a stop, a visit or vacation. This safari shall be very enjoyable. Everything is in it. You will be visiting Cities, Coastal- and Mountain towns, Usambara Mountains, Uluhuru Mountains, Village communities, Youth groups, unspoiled beaches and of course two National Parks with expertly guided Game Drives included. Distances each day are very manageable and this allows you to see the very varied landscape in detail. There will be cultural activities on your way. That is why we would be very grateful if you can bring some essential equipment with you like books, pencils, a ball or notebooks. It is not always necessary to buy these things. Just see what you have and stopped using yourself. Are you a Writer, Musician or Photographer? Mark loves Art and is active as a storyteller himself. You are very welcome to be part of an intercultural exchange on this safari. My wife and I were on the first Swahili safari in October of 2017, and it was a wonderful experience. We spent only a day on each end in the big city and for the other 14 days we were in small towns, villages, and National Parks. In Mikumi National Park, we spent half an hour at a time within 10 or 15 meters of lounging lion prides or foraging elephant herds. The lion cubs were curious about us, but the adults just ignored us. Rama Ama is a great guide. He made stuff happen and took care of us. When we were in a small village during a holiday when all businesses were supposed to be closed, he found a food shop to make breakfast for us. Mark Walker made friends easily everywhere we went. In one place he found a local guide for a walking tour and a marvelous dinner at the guide’s house. When something didn’t go as planned (which happens in Africa), both Rama and Mark were able to adapt and keep the experience going. At one town we happened upon an arts festival and changed the itinerary to spend an evening listening to many different types of Tanzanian music. We appreciated the flexibility. This is not for people who want to stay in Hiltons. We recommend it to anyone who wants to have a more authentic African experience. Mark will pick you up by taxi at the airport of dar Es salaam. He will take you to Tanzanite Executive Suites Hotel in the Center of Dar Es salaam. Depending on your condition after a long flight, you can take the rest of the day off and relax or you get a taste of the hotel environment. You will stay in this hotel for two nights. After breakfast you will be taken for a walk around the historic Center of Dar Es Salaam. Since Dar has been an important port to Zanzibar, the Middle East and Europe, there will be stories about the colonial time and slavery details too. Then we will offer you an Indian lunch, possibly served in the home of a friend of Mark or a good local café. The temperature in Dar Es Salaam is quite warm and therefore we give you time to rest after this late lunch. 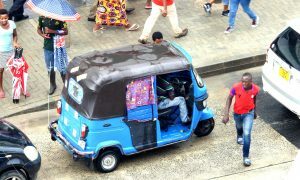 You can go to the hotel or sit at a terrace to see, hear, feel and smell the streetlife in Tanzania. After an early breakfast you will leave Dar Es Salaam and drive for a longer ride to the Vamos Hotel near Mikumi National Park for one night. We do make a reservation for Deluxe Rooms. Soon after arrival you will enter Mikumi National Park for a wonderful Gamedrive until early evening. Mikumi is Tanzania’s fourth-largest national park. It is sandwitched between three sets of Mountains, the Uluguru Mountains, the Rubeho Mountains and the Lumango Mountains. Mikumi hosts buffaloes, wildebeests, giraffes, elephants, lions, zebras, leopards, crocodiles and more, and chances are high that you’ll see a respectable sampling of these within a short time of entering the park. Mikumi is an important educational and research centre. Among the various projects being carried out is an ongoing field study of yellow baboons. The best and most reliable wildlife watching is around the Mkata floodplain, to the northwest of the main road, with the Millennium (Little Serengeti) area a highlight. Another attraction is the Hippo Pools area, just northwest of the main entry gate, where you can watch hippos at close range, plus do some fine birding. After returning to the hotel, dinner will be served. After breakfast you will depart to visit Morogoro. Morogoro is a lovely town and is positioned as a kind of Gate to Uluguru Mountains. Uluguru Mountains will show you its green tops everywhere you look. We take you for two nights to the Simbamwenni Lodge. We make a reservation for a double bedded fully furnished Tent. After settling in we will take a drive into Mororgoro town for a walk around, followed by dinner and the open air club for some life African Music. Uluguru Mountains are able to show you some of the world’s richest rainforests, containing more then ten species of reptilians and amphibians and over a hundred plants, including African violet, busy lizzies and begonias. The animals you can meet here are yellow baboons, blue monkeys, black and white colobus monkeys, wild pigs and duiker antelopes, but still the mountains are most known for its birdlife, which include fifteen rare or unique species. After breakfast you will hike to the Waterfalls on the Uluguru Mountains. You can visit and swim in one of several waterfalls on the mountains overlooking Morogoro. Your walk will take you through spice plantations and pineapple fields, and you can meet with villagers selling soft fruits and other products. We leave the mountains behind us and make a long ride to Tanga. Tanga is a lovely coastal town. Life is taken as a leisurely pace. To walk the streets can be a very joyful multi cultural experience. There are many Arab influences but also Christian characteristics. In Tanga I learned to play a specific Tanzanian game on the streets with a group of 6 men. There are markets and lovely food can be found at the side of the streets. Tanga is sometimes alive, sometimes laid back, You will spend two nights at the Panori Hotel in Tanga. We will make a reservation for a double room with sea view. After arriving Mark will introduce you to his guide friend Abdul. He will invite you to have dinner at his mum’s home. Enjoy their hospitality. Enjoy an early breakfast before getting ready for a Tanga Cultural Tour. During your walk we accidentaly will pass the famous Blue Room Café and probably accidentally again try one of their delicious snacks. Maybe we meet Abdul again here and visit with him the library and the museum. Afterwards he will for sure take you to the Amani Nature reserve. You will start with a walk through the forest. You will return to the hotel in the late afternoon and have time to relax that evening. In the morning we will depart with landcruisers to Lushoto in Usambara Mountains. We are a bit in love with Usambara. The mountains have a sort of sweet, kind atmosphere. Many times you see a lot of flowers and gently sloping hills. The red Earth in combination with all the green shrubs, grass and trees caress your eyes. On the other side there also are rough areas in Usambara. Big rocks are giving firm shapes to higher areas where the mountain is watching out over the lower plains. Yes, Usambara is one of our favorite places in Tanzania. Nature is beautiful and the views are wonderful. There is a big chance you will see a breathtaking sunset at one of the higher viewpoints like Irente viewpoint. You will spend two nights at The Lawns hotel based on double Executive rooms. If you want, you can make your first walk around Lushoto in the afternoon, drinking in the fresh air. Today you can have a quiet, relaxing morning. After lunch you are welcome to join the guide on a walk through higher areas of the Mountains. On the way you most likely will meet a peculiar little fellow. Its strategy to survive is basic but genious. It is one of the most commonly used strategies used by humans also. If you want to be safe then change your colour, change your opinion and your mood like a chameleon. By the time sunset will enfold itself you arrived at Irente viewpoint to enjoy the changing sky and the magical light shining on the land below you. Dinner will be served at the Lawns Hotel afterwards. 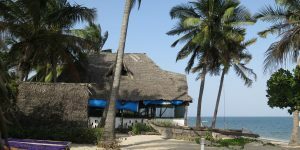 After breakfast Mark will pick you up to return to the coastal area for spending some time at Pangani Beach. We will take you for one night to Peponi Beach Resort. This photo says more then 1000 words. The beaches at Pangani and Ushongo bay are untouched and therefore idyllic. Enjoy your walks and time here. before entering Pangani Mark will visit Choba School. He is well connected with the headmistress. You will experience that meeting friends of Mark will allow you to have a true meeting with Tanzanian people. It is very difficult for tourists to come that close. Later we invite you to dinner at Peponi Beach Resort (included). Enjoy! In the afternoon you will leave Pangani for a short drive to have lunch. You will meet a local guide who will take you for a historical walk around Pangani village. Later that afternoon you will arrive at Drifters Lodge for two nights. You are very welcome to have a beach day at Ushongo Bay in your safari. You can swim, rest, sleep, read, talk and everything you feel like doing. You can have a one day diving or snorkling experience with Kasa Divers. They will take you with their boat and professional equipment to areas in sea, where you can have your first diving experience or enjoy yourself with snorkling around beautiful coral reefs. This excursion is not included and we need to make a reservation in front. After breakfast you will leave for Saadani National Park. This is the only marine park in Tanzania. You will have an afternoon gamedrive and not only look for lions, elephants and zebras but also for turtles, seabirds and if your lucky dolphins or even whales. Afterwards we will take you to Bagamoyo for two nights at Firefly Lodge. You can have a slow start today. At the end of the morning you will be invited to make a walk through the historic part of Bagomoyo. Depending on the time your flight is leaving, we will take you to the airport. We hope you fully enjoyed your time in Tanzania with Mark, his friends, our guide/driver and all the other people you have come to meet on your way these last weeks. We most of all hope you take something with you for the rest of your life. This is YOUR SWAHILI SOJOURN! This amount must be paid in euros. some meals with locals, all breakfasts, some lunchboxes in parks and dinner at Peponi.